Late one night – about 1:00AM – I was awakened by an urgent knock at the door of my hotel room. It was Bob in only his Jockey shorts. He claimed he took the wrong turn coming out of the bathroom and ended up in the hall without a key. I was with him earlier and drinking should be mentioned as part of the background. His room was on a different floor and he had to take the elevator to my room – luckily he saw no one. I gave him some clothes – but no shoes – and he trundled off barefoot to explain things to the front desk. Well, many of us would rather be caught in a hotel corridor in our underwear rather than attempt to make a piecrust. Nothing could be sillier since it is very easy to do and very Bravado. 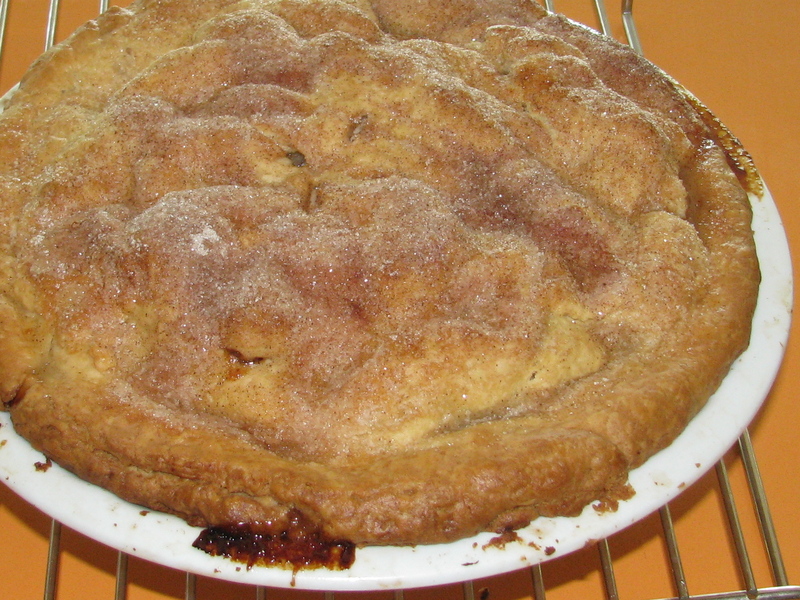 I learned to make piecrust, or pate brisée, from Julia Child – from her book, that is. 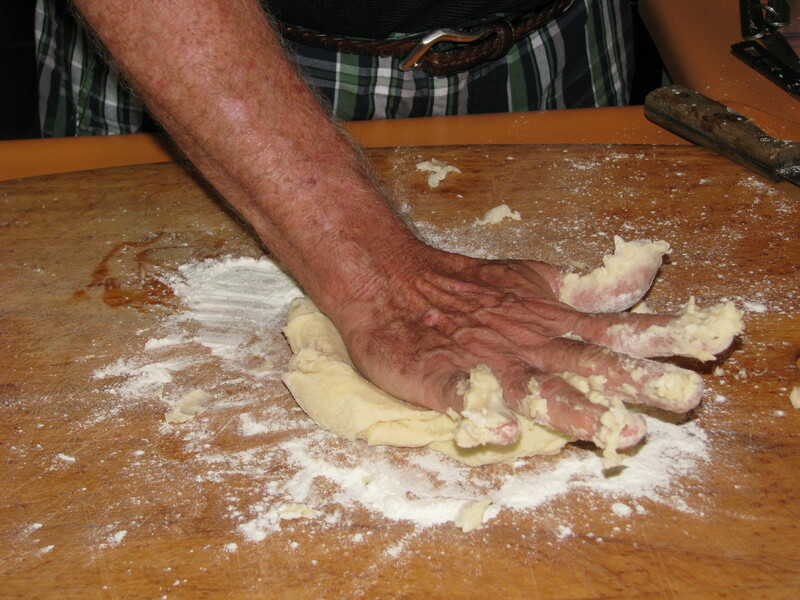 She suggests making the piecrust with one hand like the true connoisseurs in France. The very first time I tried this technique, I realized what Julia was really thinking. This method leaves the other hand free to hold a glass of wine!! Or, to put your arm around that special person who is fawning over you as you show off your culinary skills. Well, maybe not, but the free hand for wine is a real benefit. When I read the ingredients list for Pillsbury Pie Crusts, I find some things that I don’t want; namely, partially hydrogenated lard with BHA and BHT, wheat starch, rice flour, Xanthan gum, Potassium Sorbate, Potassium Propionate, Citric acid, Yellow 5 and Red 40 and NO BUTTER!! And, only God knows how long it has been frozen. Make sure there are people around to see you do this. Get a stick of cold butter, open the wrapper and cut the entire stick into thin pats and spread them out. 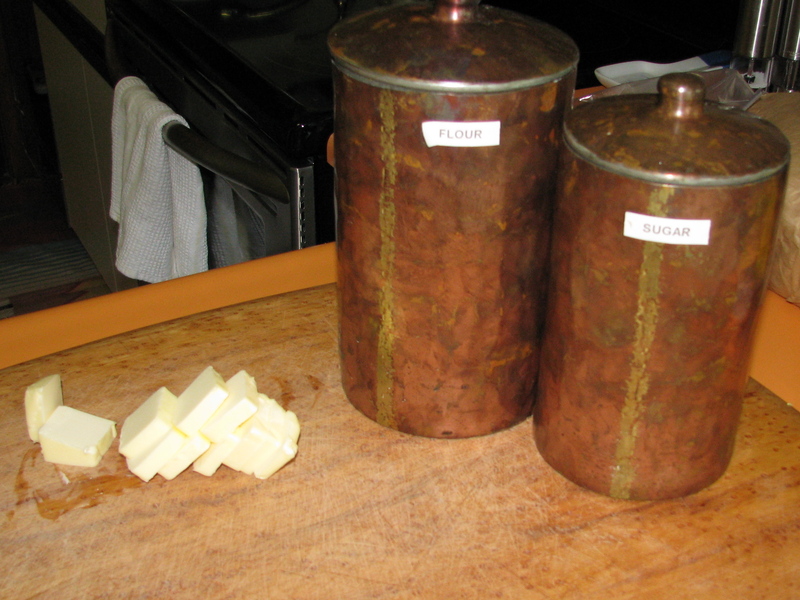 You want the butter to soften a little bit. Pour yourself a glass of wine. Mix the flour, sugar and salt in a mixing bowl. Add the pats of butter and, with the fingertips of one hand (I suggest you use your non-dominant hand), cream the butter and flour together until it looks like a bowl of lumpy oatmeal. You don’t have to get it perfect, just get it generally mixed together with no dry flour laying on the bottom. Drink you wine and toast the memory of Julia Child who died in 2004. 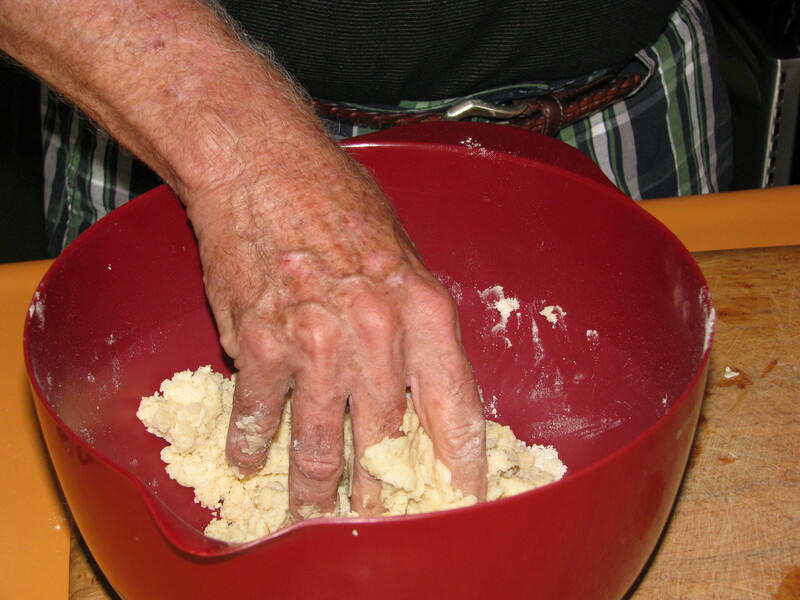 Add the cold water and work the dough with one hand for about 20 seconds. Scoop it up and put onto a floured cutting board. 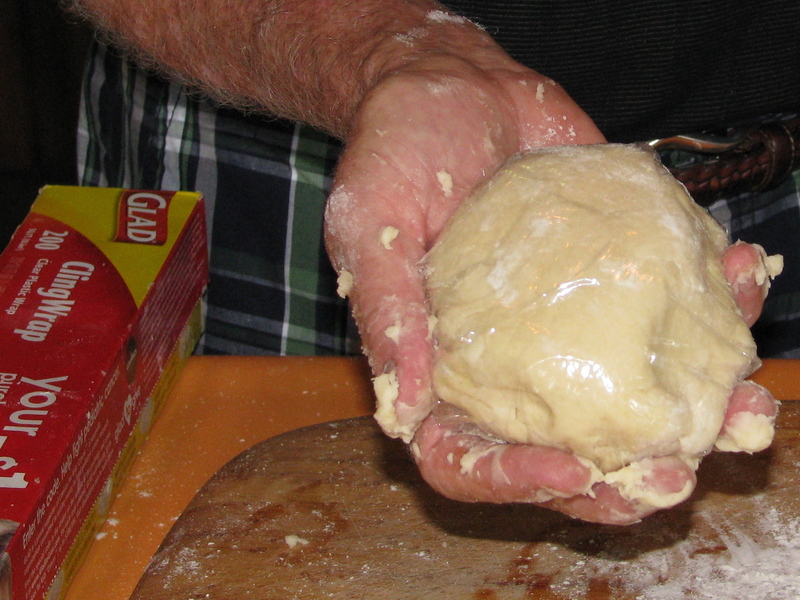 With the heel of your hand, mash the dough on the board for 20 seconds to finish the creaming process. 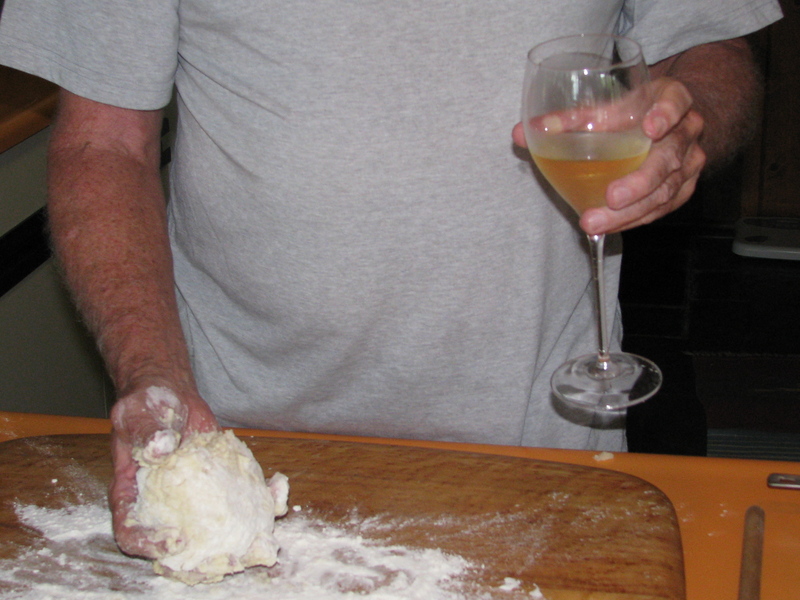 Set you wine down for a second and take a rubber spatula in your clean hand and scrape the dough into a ball. You will probably have to scrape your work hand also. Throw a little flour on the doughball, smooth it out and wrap in plastic. Put in the freezer for one hour at which time the dough will be ready to roll out. In our next post, we’ll show you how to use the piecrust to make Tarte Tatin, the classic French apple pie. Thanks, I like the concpt.